Freyr and his boar, Gullinbursti. Fro Ing (Freyr), like Wodan, is a god of kingship and the ancestor of kings and great tribes such as the Ynglings (the royal dynasties of Sweden) and the Ingvaeones (one of the oldest recorded tribes of Germania). His great importance to the early Germanic people is shown in the names of the runes; the only gods who are named directly in the futhark (runic alphabet) are Ing and Týr (Tiw). The latter's name was deleted from the Old English Rune Poem by a Christian compiler, but Ing was too deeply ingrained in the culture of the Anglo-Saxons to suffer a similar fate. The Rune Poem says of him that “(Ing) among the East-Danes was first / beheld by men, until that later time when to the east / he made his departure over the waves, followed by his wain / that was the name those stern warriors gave the hero.” The use of the wain is something common to the Wanic cult as a whole, as it has been from the earliest times. One of the central mysteries of the cult of Fro Ing (Freyr) is the god's cyclical incarnation in a mortal man who is eventually sacrificed. The first kings of the Ynglings all die in ways which makes it clear that they are Wanic (Vanic) sacrifices; one, as mentioned earlier, is hanged with an ancestral necklace; one, through the working of “witchcraft,” is thrown by his horse at the autumnal feast of the idises (ancestral women); one is drowned in a vat of mead; one is smothered in his sleep by a Finnish witch when he refuses to return to his wife; one is slain by a hay-fork; one is given to the gods by his folk because the harvests have been bad. This cyclical slaying of the king who embodies the god keeps the land fruitful. Let no man take the might of Fro Ing (Freyr) into himself who is not willing to pay the price; I know one man who specifically wished to be and remain a Wanic king and the incarnation of the god – taking upon himself the name Ingvar – and who ended by destroying everything around him because he was unwilling even to ritually surrender his leadership for a time. This sacrifice does not necessarily have to be one of life; the ritual withdrawal, however, is an integral part of the cult of Fro Ing. The poem “Skírnismál” describes how Freyr first withdraws from all company of the gods, then has to give up his horse and his sword in order to win the etin-woman Gerdhr in marriage; this represents the surrender of Ing's manly might either through death or by a ritual relinquishment of power This was probably seen as a seasonal withdrawal; the god who embodies the life of the earth and the fruitfulness of the fields secluding himself in the dark months from Yule to plowing-time. The rulership of Fro Ing (Freyr) is a rulership of frith (fruitful peace) and joy. The name Frodhi, “The Fruitful,” was given by the Danes to several of the kings embodying Fro Ing's might. The beasts dearest to Fro Ing (Freyr) are horned cattle, horses, stags, and boars. He was usually given an ox or a boar as sacrifice. The horse also appears as a beast given to Fro Ing; not usually in the sense of a slain sacrifice, but as a living holy creature who was carefully tended and concerning whose care there were several taboos. 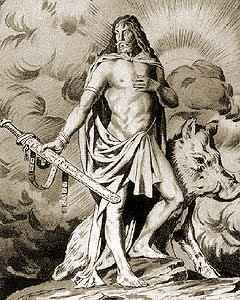 The animal which is most central to the cult of Fro Ing (Freyr), however, is the boar. His own boar is called Gullinbursti (“Golden-Bristled”) or Slídhrugtanni (“Cutting-Tusked”); he was forged from an ingot of gold and a pig's hide by Eitri, the dwarf who also made Wodan's ring Draupnir and Thunar's hammer Mjöllnir. This boar is the only beast Fro Ing is ever said to ride, as he had given away his horse Blódhughófi (“Bloody-Hoof” – a name probably implying that Fro Ing rode this stallion into battle). Statues of Fro Ing (Freyr) are always equipped with a particularly large and erect phallus, as they have been from the earliest times; such wooden idols from an early period have been found in the bogs in Denmark. Adam of Bremen also mentions that the statue of Freyr at Uppsala was particularly notable for this characteristic, and a small bronze image (clearly meant to be carried on the person) from eleventh century Sweden also displays Freyr's very large phallus. Freyr is said to have gotten his hall Álfheimr as a tooth-gift. This association of Fro Ing with the alfs shows a side of his being which is not often called upon: the mound-god, the lord of the dead who still live within their barrows. As mentioned earlier, his earthly avatars were worshipped within the mound, just as the alfs were. Through his role as god of the barrow and fro of Alf-Home, Fro Ing is also tied to the living might of our fore-gone kin and to the inheritance of udal lands. In the sagas, his friendship preserves the lands of his followers; but when his wrath is roused, he drives men from their lands.